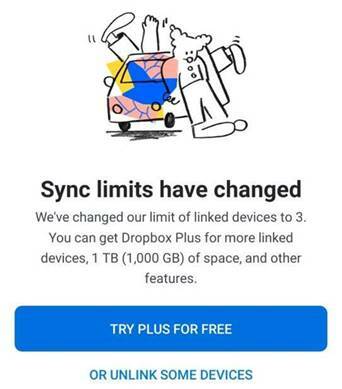 Dropbox has removed unlimited device linking for free accounts, though the limit doesn’t apply to browsers. The cloud storage vendor revealed its free Basic account now has a three device limit from the start of this month. Only paid plans will now come with unlimited device linking, with prices starting at $12.74 per month for individuals or $17.50 per user per month for businesses. The limit doesn’t apply to browsers, however, so users are still able to sign into multiple machines through Dropbox’s website. Customers can change which three devices are linked to their accounts. Those trying to add a fourth device will be greeted with a warning, inviting them to unlink some of the already linked devices, while also pushing for upgrades to paid plans. Customers who have already reached past the limit prior to this month will still have their devices linked, but they won’t be able to link additional devices.